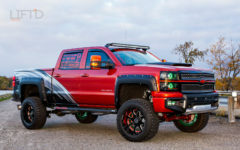 Truck owner, builder, and all around auto enthusiast, Jeff Cleer, has had a historical relationship with custom cars and trucks. 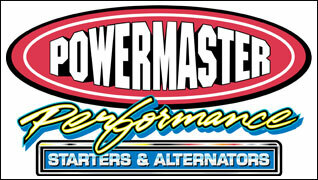 His childhood was spent next to an oval dirt track, where he would begin his journey with the industry. 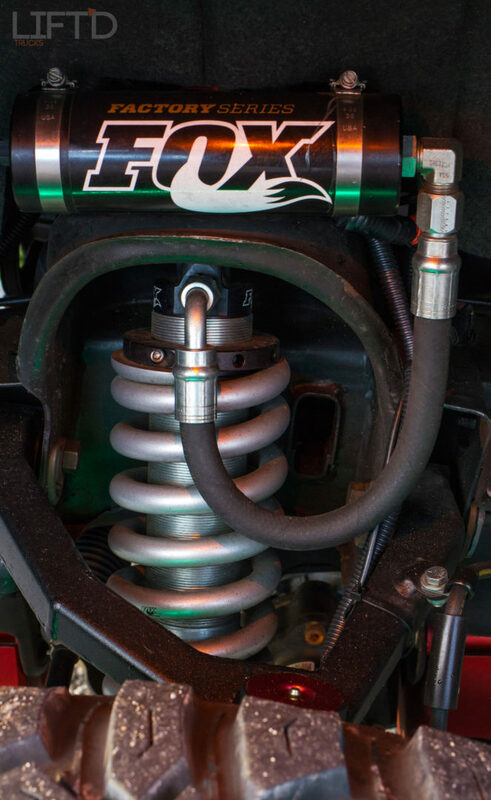 At just five years old, a serious hip surgery left Jeff to spend six months in a body cast. 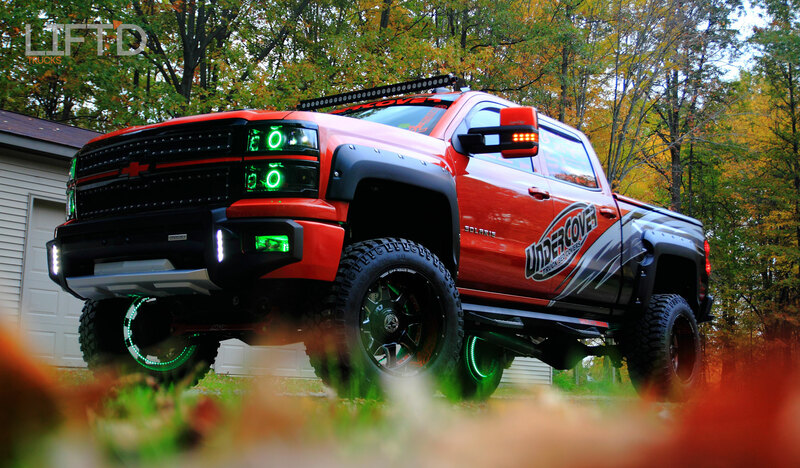 He spent this time drawing the race cars, trucks, and motorcycles that he continued to grow up around. 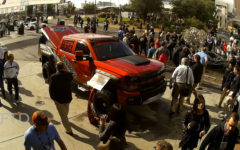 As he grew older, his automotive passion grew as well, motivating him to work amongst dirt track pit crews and even build and race his own dirt track car. 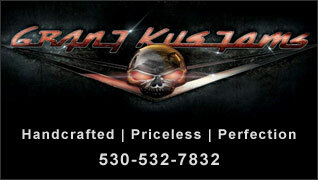 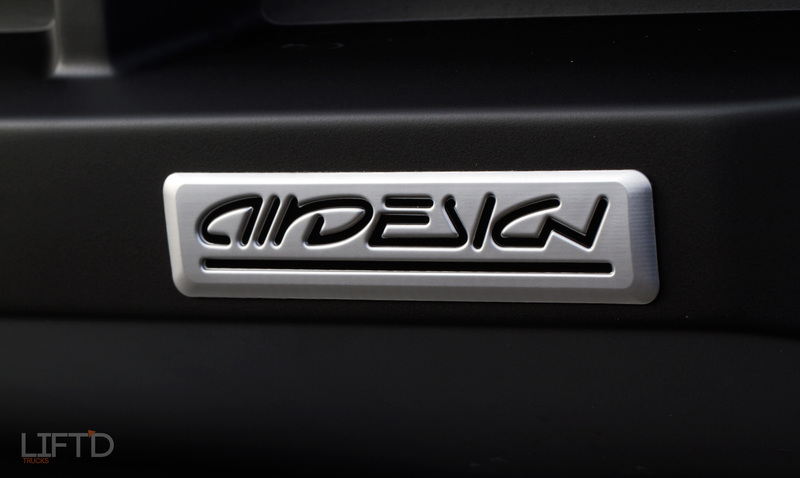 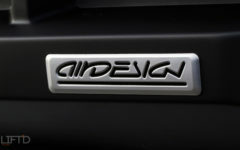 While maintaining a love for custom cars and trucks, Jeff eventually opened a printing and sign shop. 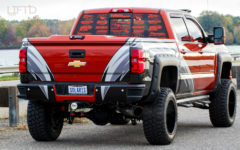 Much of his work revolved around the automotive industry, printing wraps, graphics, advertisements, lettering, and more. 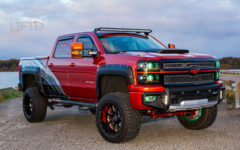 Jeff purchased the Chevy truck now known as SOLARIS brand new and bone stock in 2015 and soon beginning the build process with the help of his friends and family. 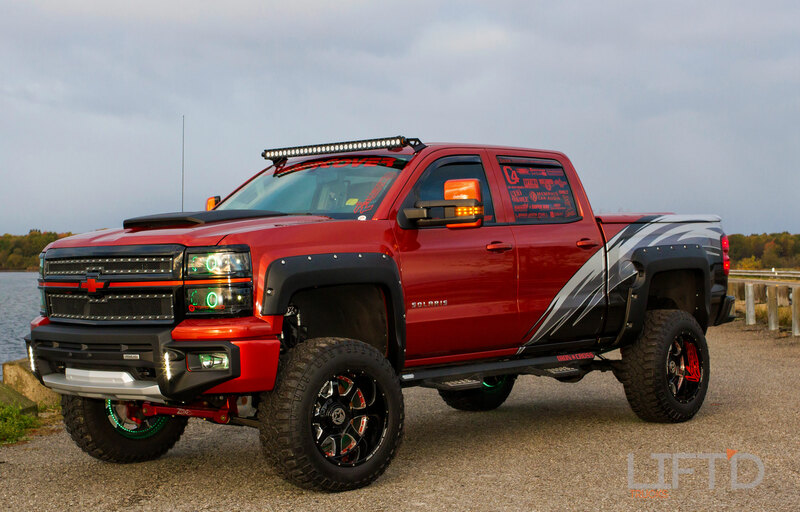 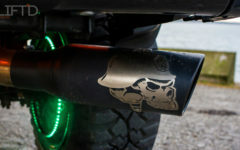 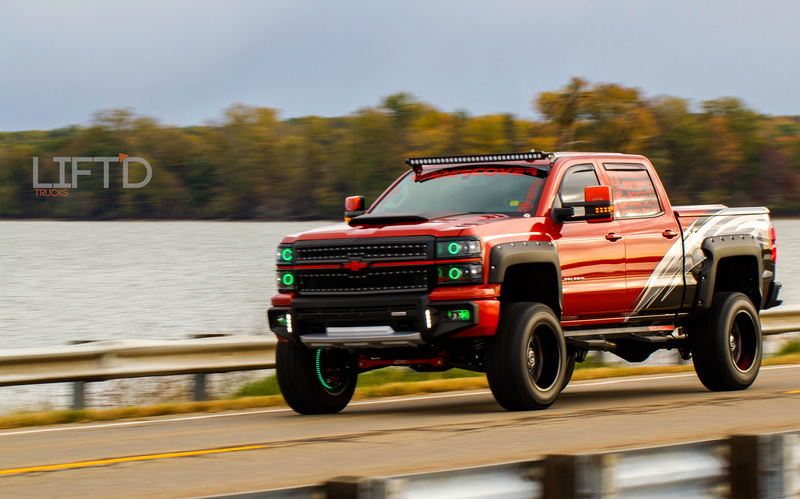 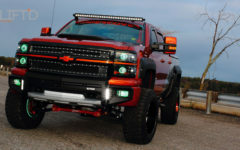 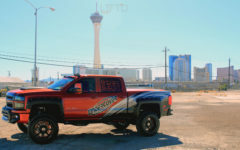 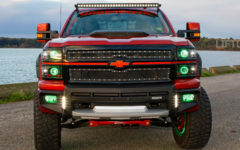 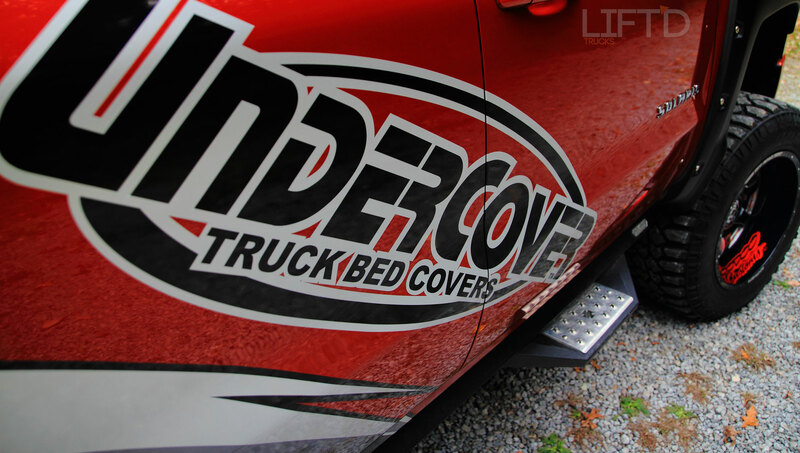 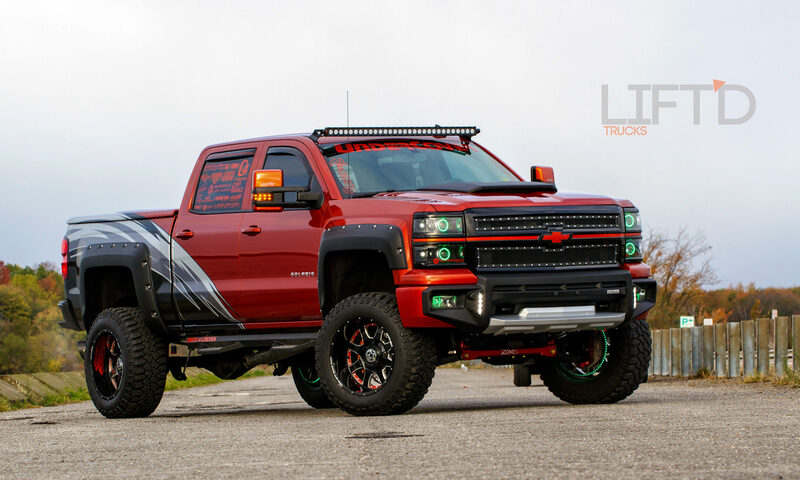 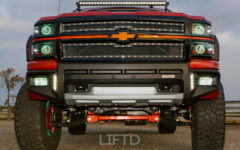 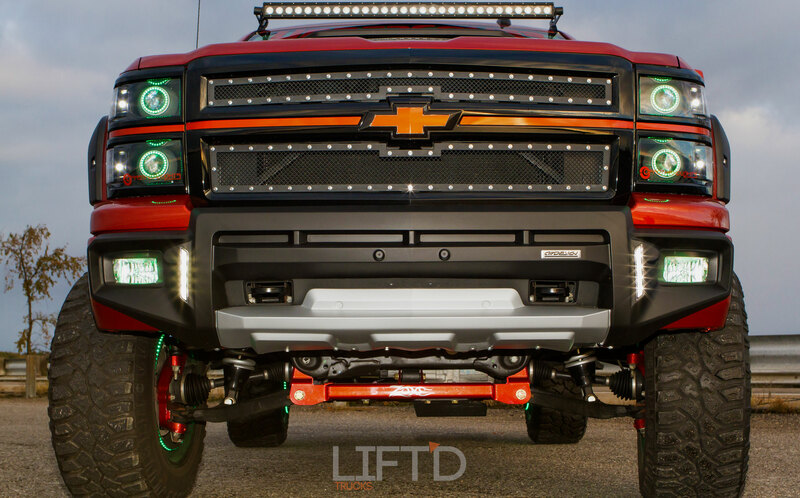 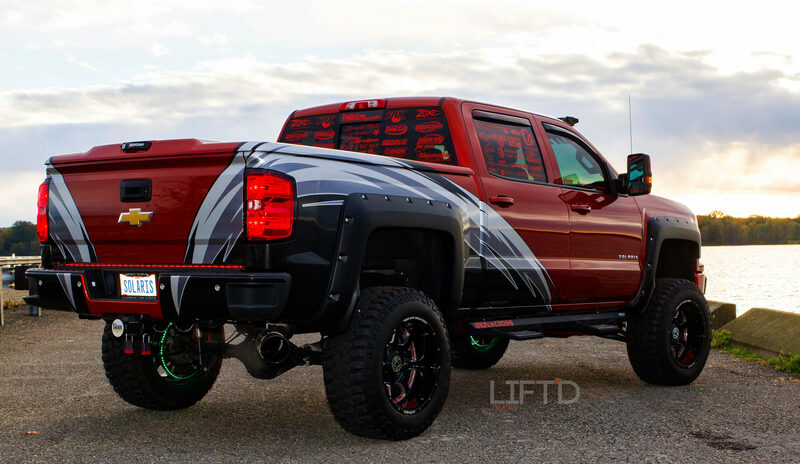 His love for custom culture and modified trucks planted in him a goal to create the ultimate Lift’d daily driver that would proudly display an array of carefully selected “every mans” aftermarket truck accessories. 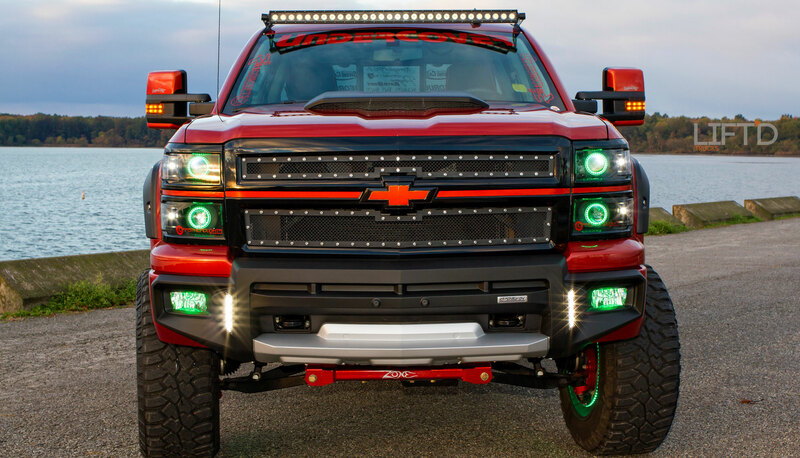 He had in mind a truck with show stopping aesthetics and everyday usability, rolled into one badass build. 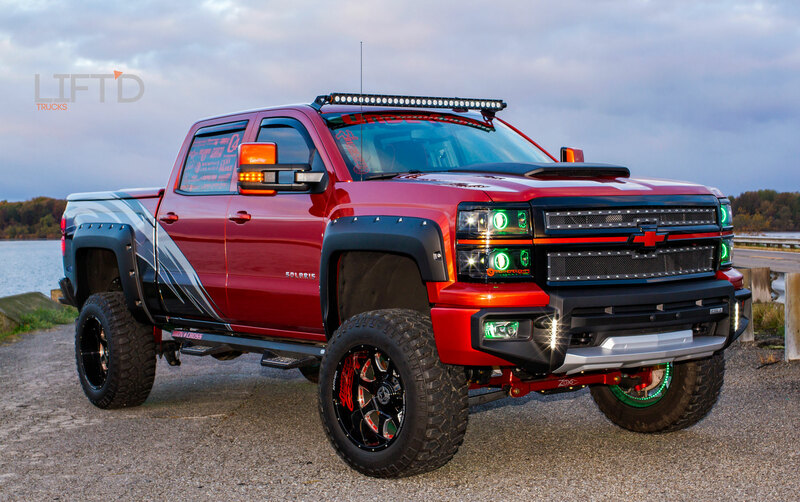 In his home state of Ohio, Jeff is a regular participant of local custom car and truck shows. 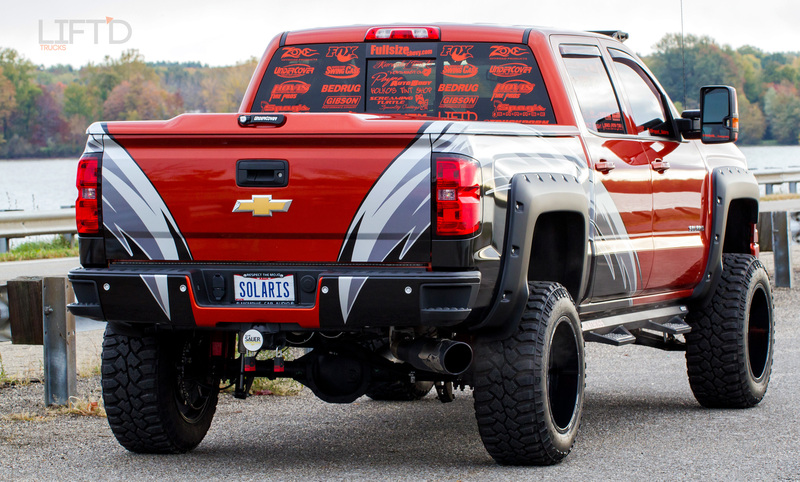 He wanted to take Solaris to as many shows as possible throughout her build process. 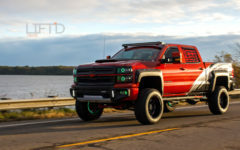 It was exceedingly important to Jeff to demonstrate to other enthusiasts that a custom vehicle like his can be built practically and within an individual’s unique budget. 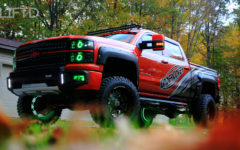 With this aim in making available the motivation and information on how to pursue a build from the ground up, Jeff built SOLARIS in like fashion. 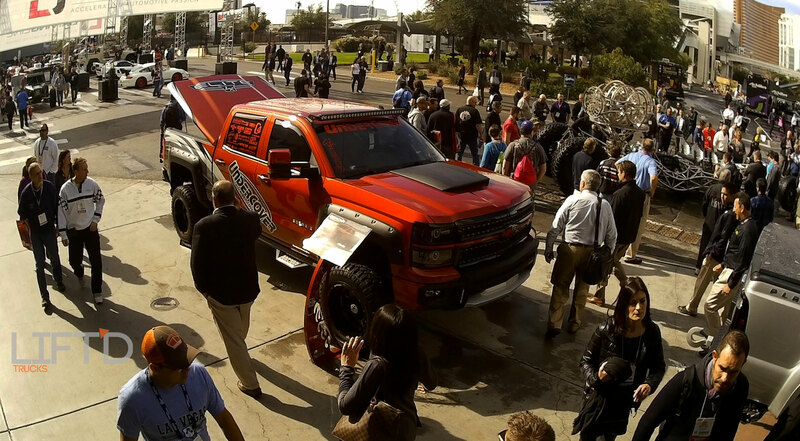 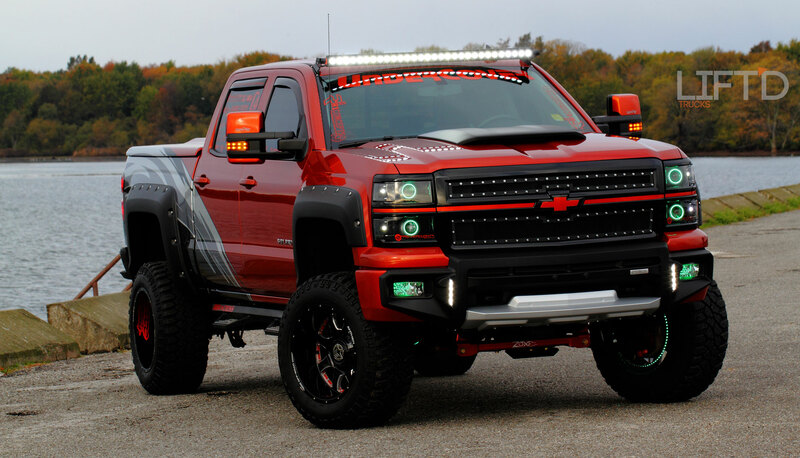 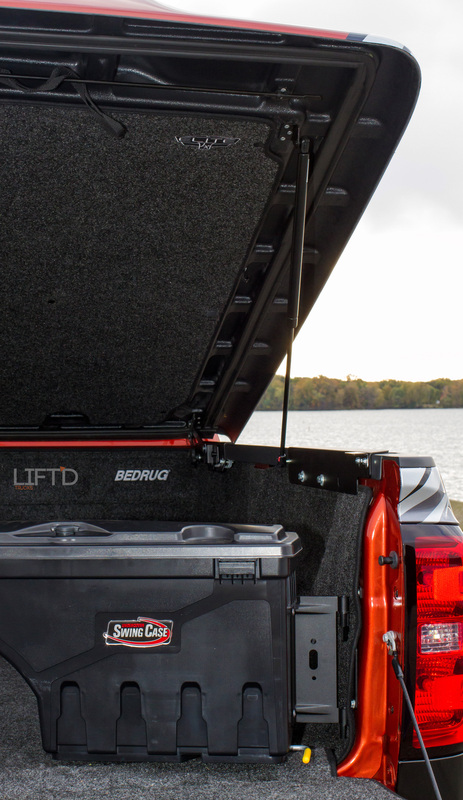 The 2015 Silverado was modified, not in a million dollar facility, but in the home garage. With the helping hands of his wife, their five daughters, closest friends, and fellow members of the Kurupted Trucks club (of which Jeff is the President) his Chevy was pieced together through long nights and short weekends. 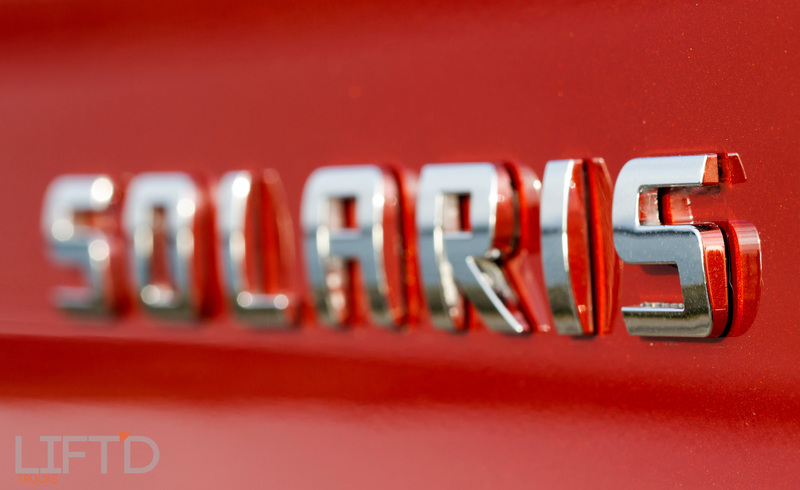 All along the way SOLARIS kept a constant presence on Social Media, allowing consumers and enthusiasts to follow the progress and share in the build. 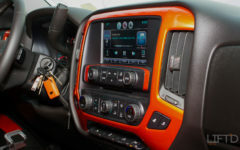 This helped Jeff to be able to coordinate show visits and attendance, meeting people with shared passions along the way. 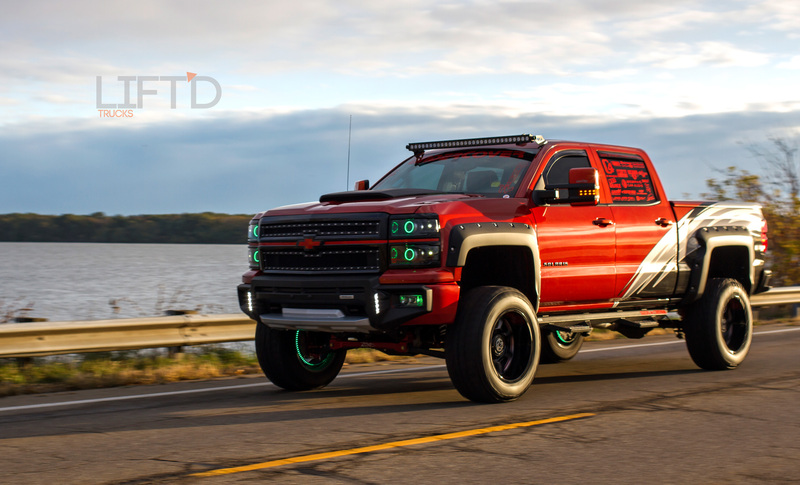 The customization process began with a rendering and collaboration from Karbon Kreationz, which of course called for a nice lift and new set of shoes. 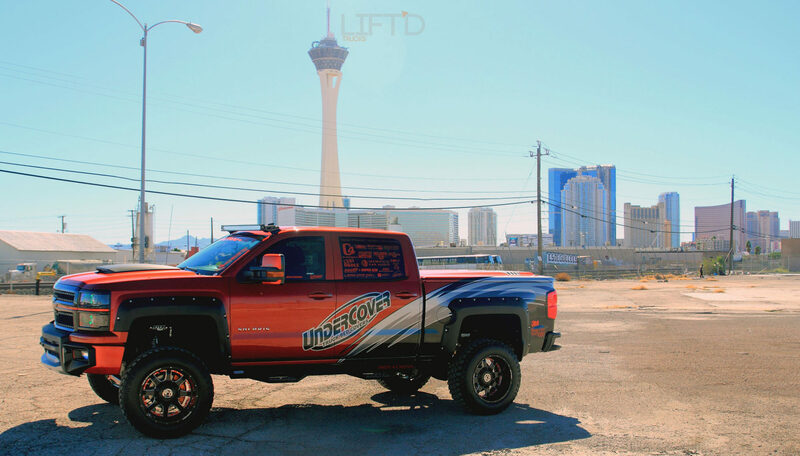 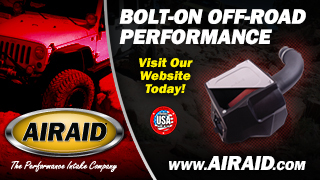 The truck is supported by a Zone Offroad 6.5-inch lift in the front, coupled with Fox coilovers. 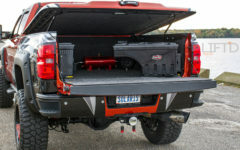 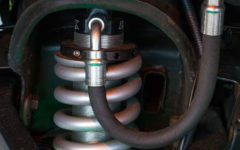 The rear, in similar fashion, is elevated by Zone lift blocks, an added leaf spring, and Fox shocks as well. 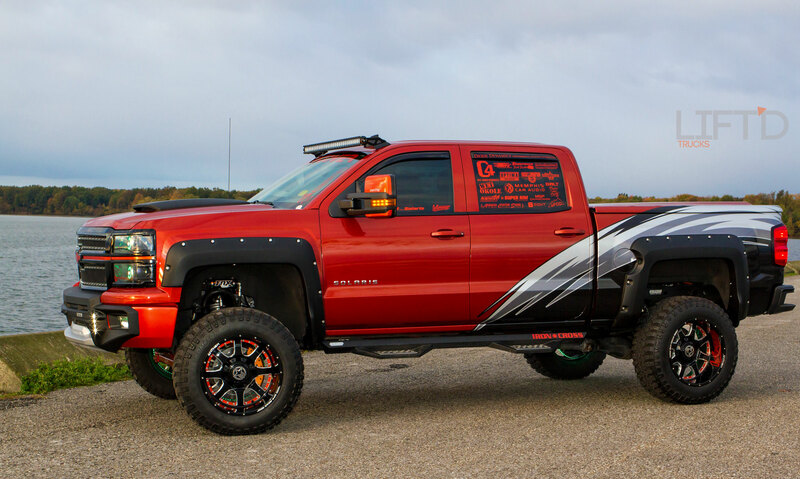 Zone Adventure Series upper control arms finish off the suspension components, most of which have been custom powdercoated by Troutman Trick Trucks and Screaming Turtle Specialty Coatings, to match the truck’s theme. The wheels are squared Anthem Off Road Commanders, sized at 20×12-inch with -44 offset. Beautifully aggressive, Mickey Thompson Deegan tires, 35×12.5×20, are wrapped around the AOR’s. 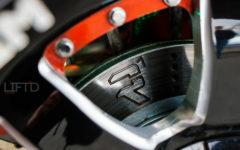 Behind the rollers, sit R1 Concepts logo rotors and brake pads. 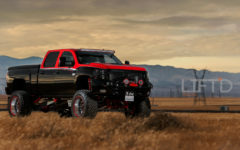 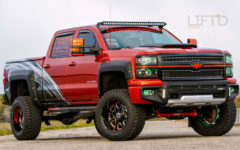 The build harnesses a mean style and look, the exterior is customized by Super Rim Truck Accessories bumper cover, fender flares, and hood scoop. 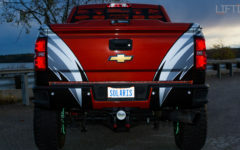 Grille inserts from Spag’s Garage help to set off the front end. 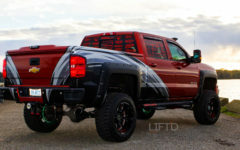 Further more, Iron Cross Automotive HD sides steps, UnderCover Elite LX Tonneau bed cover, C4 Offroad Products 50-inch light bar, bed lighting and LED underglow, Diode Dynamics LED replacements in all exterior lights, Diode Dynamics RGB LED halos and switchbacks, and custom LED wheel rings, all complete the exterior modifications. The most serious exterior modification however, is the paint and graphics job. 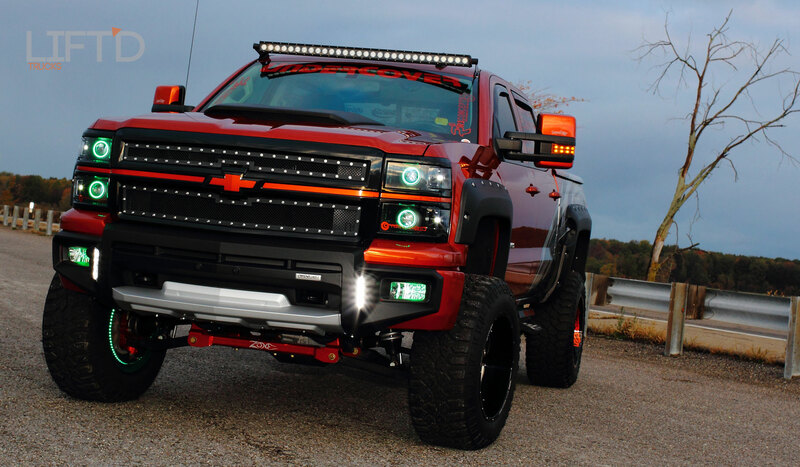 The heavy flaked GM color is Sunset Orange Metallic, AKA Orange You Tempted. 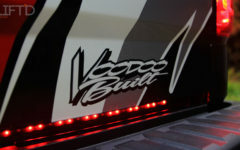 The drastic color in combination with the graphics and array of LEDs tips the scales completely in SOLARIS’ favor. 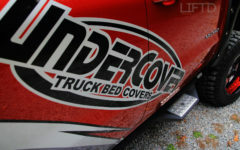 Other modifications and accessories include UnderCover Bedrug Swing Cases and bed mounted LED changing speakers. 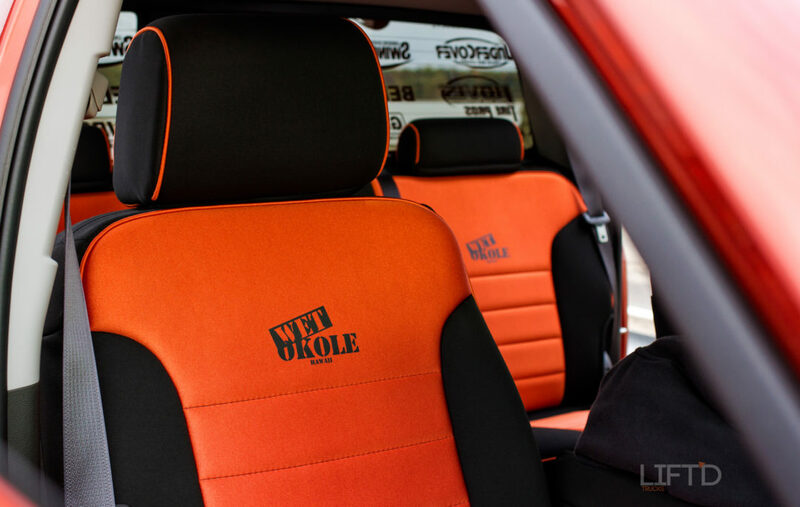 The interior seats are covered in Wet Okole Hawaii covers, Super Rim molded liners finish the flooring. 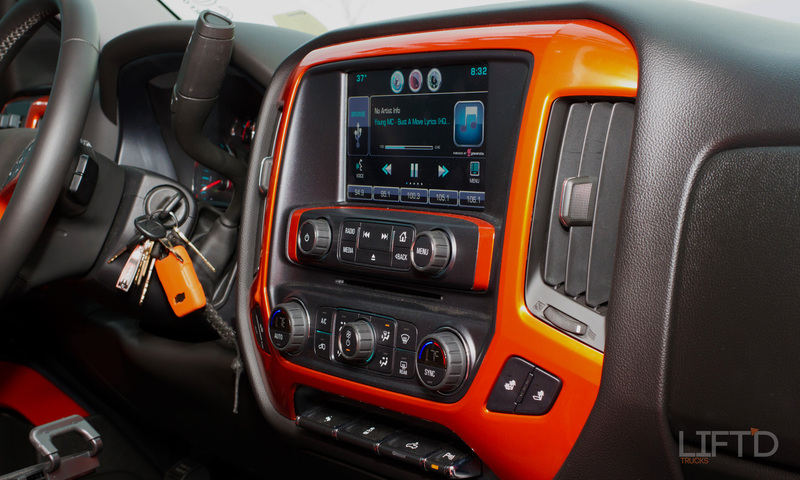 The interior trim is wrapped in 3M Vinyl to match the exterior color scheme. 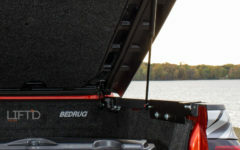 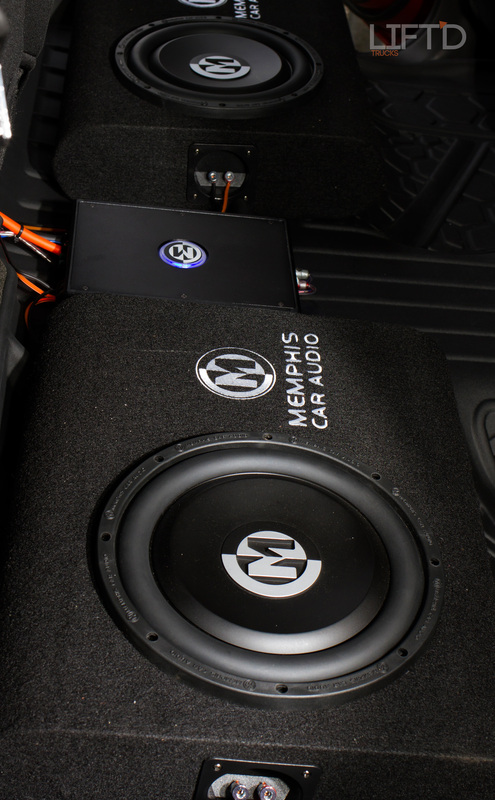 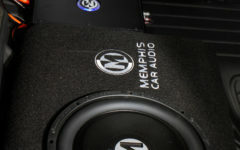 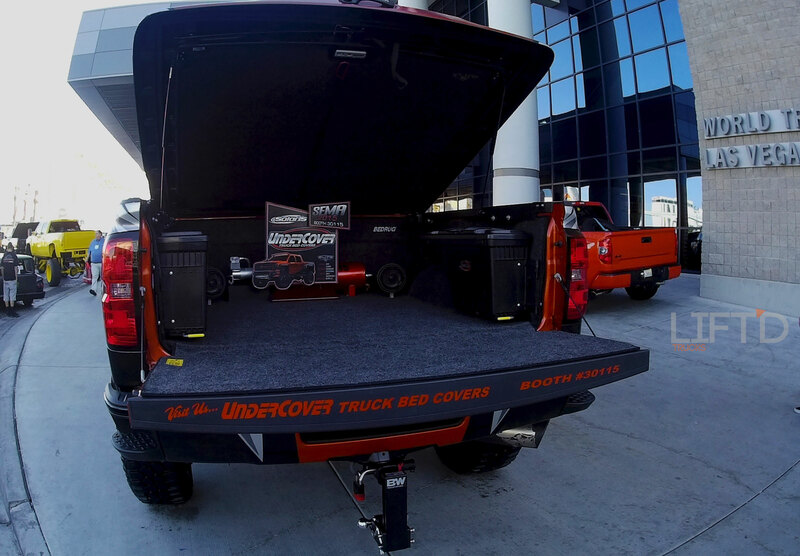 Audio equipment includes GM factory head unit, Bose mids and highs, Memphis Audio 8-inch lo-pro subwoofers, and Memphis amplifiers, all using dual Optima red top batteries as motivation. The bulletproof 5.3L powers SOLARIS and breathes through a K&N Blackhawk cold air intake system. 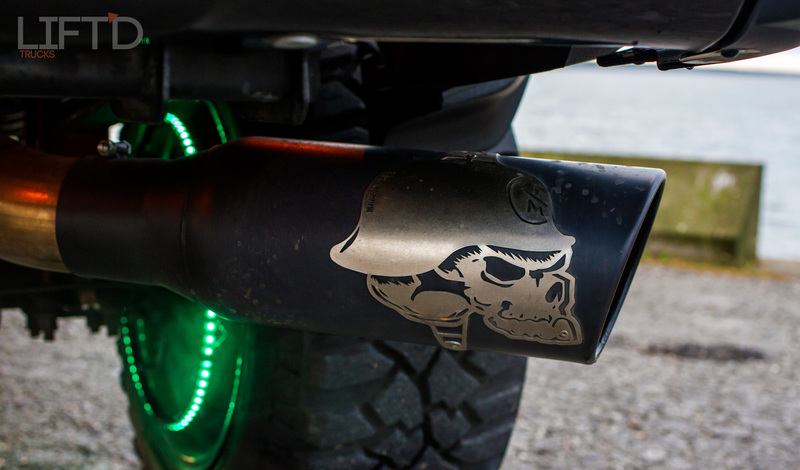 The exhaust breathes nicely through a full set of Gibson Performance ceramic coated headers and Gibson Metal Mulisha catback system. 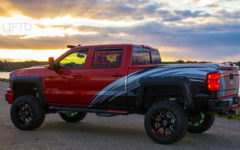 While the V8 certainly offers plenty of power as it sits, Jeff plans to further up the ante with high lift cams and supercharged induction in the near future. 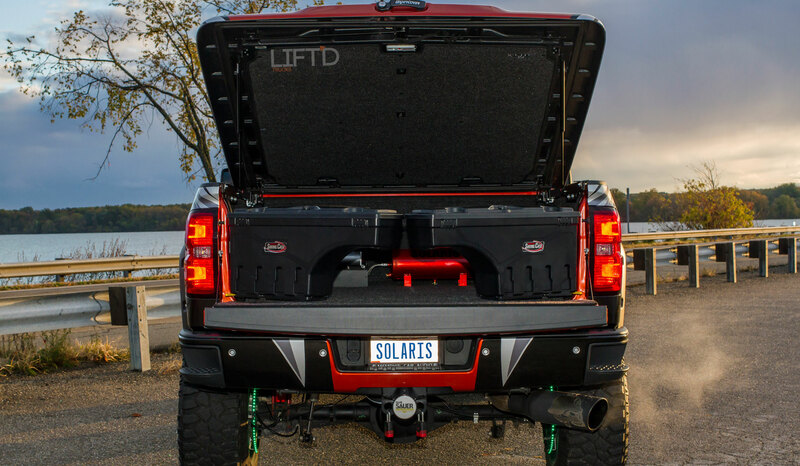 SOLARIS, as a truck, embodies the motivation to continue growing and building. 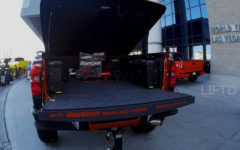 With a straight forward task of creating the ultimate daily driving show truck pulling double duties, a desire to motivate and encourage other members of the enthusiast communities, and an unwavering love for all trucks, Jeff Cleer and his family have built something special. 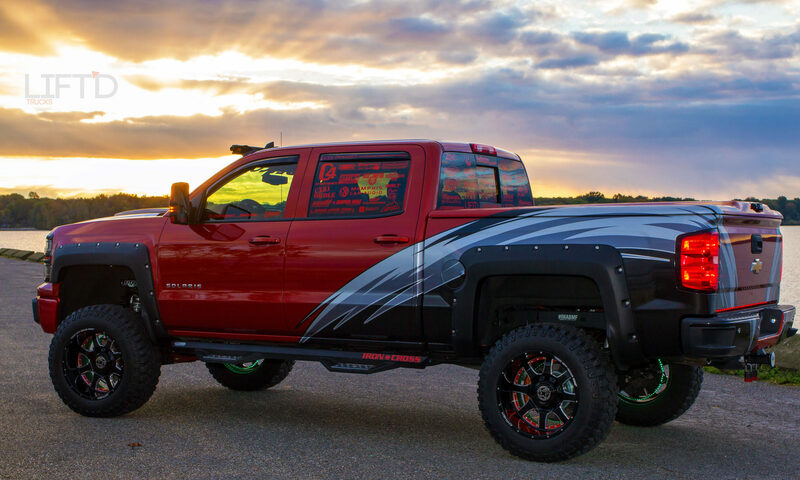 More than just a vehicle, this build represents an opportunity to set goals and achieve them, to share a common target, and to grow together. More than a compilation of incredible parts and products, more than a representation countless hours of hard work, SOLARIS is a truck about the people who built it and the people they get to share it with for years to come. 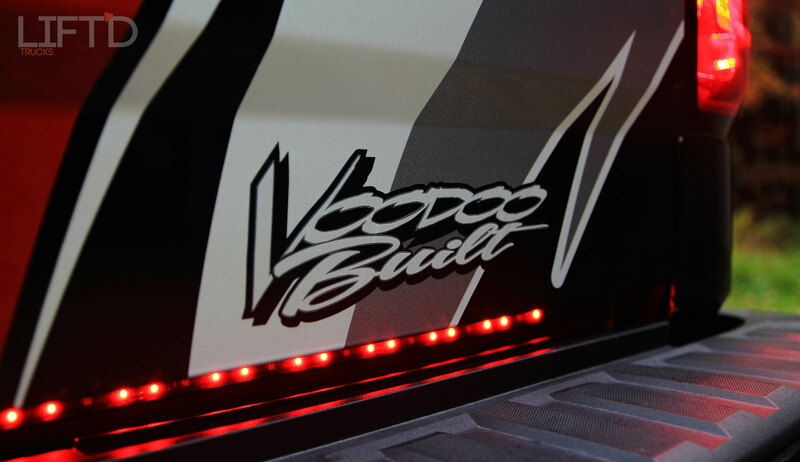 Diode Dynamics RGB LED halos and switchbacks.